I often wonder how many people realize that every day that goes by, our drinkable water gets more and more contaminated with prescription drugs, pesticides, and toxic wastes for which the water is not even tested before it comes through our taps. Our babies and grandchildren are drinking concoctions that did not even exist when we were kids. That should worry us. It does me. That is why we drink home purified water every day. 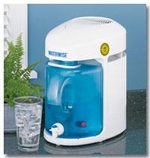 We carry the best water distillers on the market- Waterwise® distillers. 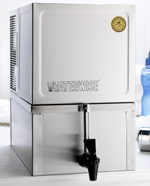 We have used our Waterwise® distiller since 2005 and have absolutely no complaints. The water tastes great, and I know it's pure because I distilled it myself. You can't get that from bottled water! 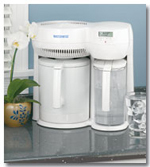 If you don't know why you should drink distilled water, it is time you learned! Distilled water can help prevent or alleviate many symptoms of disease, and it is the only water you should be drinking. 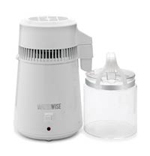 You are welcome to learn more about Waterwise® distillers or read our article on Distilled Water Myths. You might also be interested in this fluoride information since most water in the US has not only natural fluoride, but added fluoride as well. We also have books on water for health that you might be interested in reading. Compact and portable, perfect for traveling! Programmable, and filter change notification. 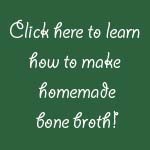 Can be used on kitchen or wood-burning stove, propane grill, and even a campfire! Higher volume production, can be hooked up to water line for continuous distillation. For larger families and for the workplace.